January is, traditionally, a healthy month spent recuperating from festive frolics and exertion. Fortunately, Glasgow fails to comprehend the term quiet night in, and an array of parties to choose from continues, from the formidable King Tut’s New Year’s Revolution to the endearing and irreplaceable Celtic Connections festival. With snow blanketing the suburbs, it was down to Glasgow Royal Concert Hall to thaw the fingers and draw the crowds in. The Danny Kyle stage, named after the legendary Scottish folk singer, is held within the Exhibition Hall and has been the platform where a number of now-established names presented their talents. This free-entry stage welcomed submissions from rising musical acts to exhibit their songs in an effort to reach a ticketed showcase concert on 1st February 2015. 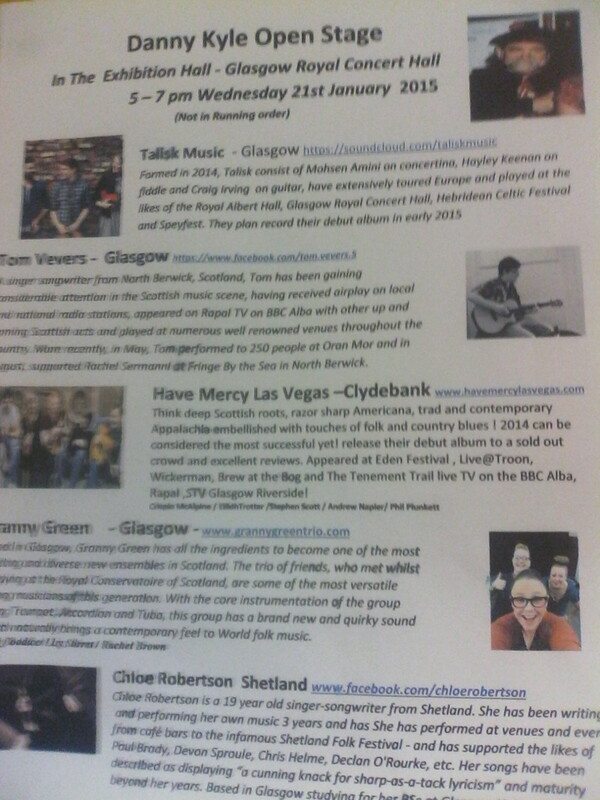 Now five nights in, and with Celtic Music Radio streaming the event, tonight’s acts included one of the Vale of Leven’s most-loved bands, Have Mercy Las Vegas. Described by Jim Gellatly as “an ideal festival band with stacks of energy”, the Vegas have been building up a steady following across the country over the last couple of years with their obstreperous, rollicking sounds blended with congenial polyphonic harmonies. With debut album ‘That’s Life’ neatly tucked into the rear-end of 2014, the band were keen to propel their West Dunbartonshire-flavour of roots and blues and rally the frozen audience into stamping grit off their boots; raise one mitten to the roof. With no fewer than six band members, most stages are usually squeezed to fit the full Vegas crowd in. It was apparent from the start that bassist Marc McLean would be forced to play much of the set with his back to the crowd in an effort to avoid feedback. This ploy worked as the band eased themselves into EP release and fans’ favourite “Tear To My Eye”. The glorious echo of the line hanging out with an angel quickly had the seated crowd yearning for more. This was followed by a frenetic, feverish “Barn Stomp”, led by Andrew Napier’s agitated fiddle and Stephen Scott’s equally frenzied banjo-playing. It was a smart move by Vegas to showcase different strings to their bow, pardon the pun, slowing things down with lead singers Crispin McAlpine and Eilidh Trotter sharing harmonies on the lesser-played “Plastic Promises”, before rounding off their 4-song set with the wonderful “Bonnie and Clyde” from their debut album. 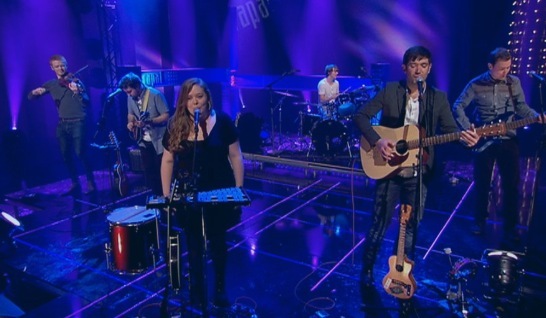 Have Mercy Las Vegas performing on the BBC Alba programme, Rapal. Second to the stage was student Tom Vevers. This was a far more intimate performance which allowed Vevers to demonstrate a sweet display of acoustic guitar and vocal dynamics. Opener “Wait And See” had shades of Tom McRae, captivating the 250 capacity-filled audience. A slower-paced love ballad “Science Class” followed after Vevers’ witty repertoire between songs, begging the subject of the piece Where do you think the light goes when it leaves your eyes?, and one final song “Low” wrapped up a short, but effective set. Following Vevers was the treat that was Granny Green. 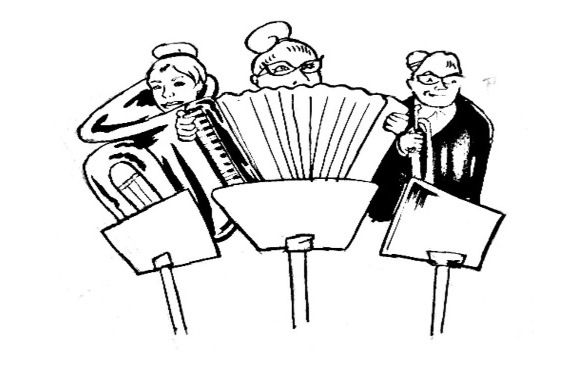 This trio consist of a trumpet, an accordion, and a much-cherish tuba. Stamping their own mark on an established opener, it was left to tuba player Rachel Brown to provide a quite breathtaking opener for second number, “Fnook” (Ladies, correct me if this is not the right spelling but I do remember that it is a Norwegian word for ‘something small’). A fascinating display of musicianship which managed to make the tuba sound like a didgeridoo and a drumkit in places, and a true delight to see and hear live. The Granny Green girls rounded off their set with a third song, mournful to start with but gradually twisting, turning, bordering on film noir as they reached the climax. This was the first band since Grousebeater Soundsystem at Loopallu Festival in 2009 that has made me smile ear to ear at sounds that belongs to no genre and are entirely original. Shetland lass Chloe Robertson filled the fourth spot with an acoustic set similar to the afore-mentioned Vevers – each song improving on the one before it. Robertson’s warm manner shone through songs “The Symptoms And The Signs” and “Stitches” – the latter was described as a gentle let-down. Feasibly the strongest song that emerged was the clever “Insomnia”. Hardly breaking new ground on subject matter, but Robertson’s ability to lend her own personal experience in the songs draws listeners in like moths to a flame. The fifth and final number “Fish Out Of Water” was penned when Robertson was a mere 15 years old, which makes it all the more remarkable that this was a delightful way to finish her turn on the Danny Kyle stage. The final act of the evening was the recently-formed Talisk. This trio had already performed at the Royal Albert Hall and were a clear favourite among large sections of the audience. The balance between concertina, fiddle and guitar quickly engaged the audience into hand-clapping and whooping along with each number. Talisk’s interpretation of traditional music wasn’t to my own tastes, but a version of “Baby Broons” was a welcome addition within their set, and Mohsen Amini’s concertina on final song “Kettles” was highly moving, suggesting that this band deserved their place every bit as much as their peers this evening. It was then left to host Liz Clark to thank all who had contributed to a wonderful evening and wait to hear in approximately one week’s time which successful act will proceed to the illustrious ticketed event.